New town. New school. New body. Ethan is a freshmen at high school, a normal teenage boy about to begin the last four years of education. Until he wakes up as a girl. As it turns out, due to lack of information from the parents, Ethan is a Changer, a race of humans who Change every year, to either a boy or a girl, until they graduate. Once graduation arrives, they get to choose which version of themselves from the past 4 years they want to be for the rest of their lives. As you can imagine, Ethan (who is now called Drew) is horrified, shocked, and creeped out by this sudden change in gender. As if high school wasn't hard enough. Now she has to not only deal with the catty girls at school - led by Mean-Girls-esque Chloe - try to be friends with Audrey even though Drew can't actually share her true self with her, but she has to figure out how to be a girl. Being a girl is hard enough, but when you've been a boy, it's even more difficult. 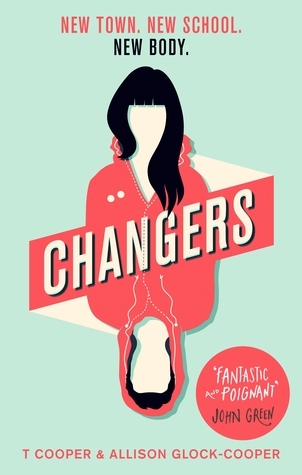 As Drew goes through her first year at high, she has to keep a mental diary of the things she's experiencing as a Changer, and she must remember a set of rules, as laid out in the Changer's Bible; Never tell anyone what you are. Never disobey the Changers Council. And never, ever fall in love with another Changer. This was a fun book. At only 277 pages, it was a fast read and one that could be easily done in a few hours. It had your typical sort of characters in it - the Mean Girl of the school, the idiot Jock, the sweet best friend, the good-looking but forbidden love interest - but with the extra layer of 'could have been the other gender last year' added in, it makes for some interesting reading. While I think that the Coopers have written the book very well, considering it's topic, and the way they had to write a boy's character in a girl's body, I think I was expecting more shock from Ethan at the beginning. Yes he was alarmed, and yes he had to wear different clothes and figure out what a bra was, but there was a lot more that could have gone wrong, which would have made it more humorous I think. But perhaps that's not what they were going for. For a short read, it was an enjoyable one, and while there are 3 more books to come (presumably one for each year Ethan/Drew changes/each year of high school) I may read the others if they fall into my hands, but I won't be rushing out of my way to read them. For fans of YA, with a bit of a fantasy spin. Group Collaboration | Love That? Try This! Features | Are You Too Old For Children's Books?